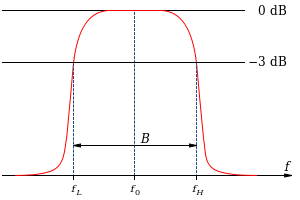 Bandwidth measured at half-power points (gain -3 dB, √2/2, or about 0.707 relative to peak) on a diagram showing magnitude transfer function versus frequency for a band-pass filter. A medium-complexity example of a band-pass filter. A band-pass filter, also bandpass filter or BPF, is a device that passes frequencies within a certain range and rejects (attenuates) frequencies outside that range. An example of an analogue electronic band-pass filter is an RLC circuit (a resistor–inductor–capacitor circuit). These filters can also be created by combining a low-pass filter with a high-pass filter. Bandpass is an adjective that describes a type of filter or filtering process; it is to be distinguished from passband, which refers to the actual portion of affected spectrum. Hence, one might say "A dual bandpass filter has two passbands." A bandpass signal is a signal containing a band of frequencies not adjacent to zero frequency, such as a signal that comes out of a bandpass filter. An ideal bandpass filter would have a completely flat passband (e.g. with no gain/attenuation throughout) and would completely attenuate all frequencies outside the passband. Additionally, the transition out of the passband would have brickwall characteristics. In practice, no bandpass filter is ideal. The filter does not attenuate all frequencies outside the desired frequency range completely; in particular, there is a region just outside the intended passband where frequencies are attenuated, but not rejected. This is known as the filter roll-off, and it is usually expressed in dB of attenuation per octave or decade of frequency. Generally, the design of a filter seeks to make the roll-off as narrow as possible, thus allowing the filter to perform as close as possible to its intended design. Often, this is achieved at the expense of pass-band or stop-band ripple. The bandwidth of the filter is simply the difference between the upper and lower cutoff frequencies. The shape factor is the ratio of bandwidths measured using two different attenuation values to determine the cutoff frequency, e.g., a shape factor of 2:1 at 30/3 dB means the bandwidth measured between frequencies at 30 dB attenuation is twice that measured between frequencies at 3 dB attenuation. Optical band-pass filters are common in photography and theatre lighting work. These filters take the form of a transparent coloured film or sheet. A band-pass filter can be characterized by its Q factor. The Q-factor is the reciprocal of the fractional bandwidth. A high-Q filter will have a narrow passband and a low-Q filter will have a wide passband. These are respectively referred to as narrow-band and wide-band filters. Bandpass filters are widely used in wireless transmitters and receivers. The main function of such a filter in a transmitter is to limit the bandwidth of the output signal to the band allocated for the transmission. This prevents the transmitter from interfering with other stations. In a receiver, a bandpass filter allows signals within a selected range of frequencies to be heard or decoded, while preventing signals at unwanted frequencies from getting through. A bandpass filter also optimizes the signal-to-noise ratio and sensitivity of a receiver. In both transmitting and receiving applications, well-designed bandpass filters, having the optimum bandwidth for the mode and speed of communication being used, maximize the number of signal transmitters that can exist in a system, while minimizing the interference or competition among signals. Outside of electronics and signal processing, one example of the use of band-pass filters is in the atmospheric sciences. It is common to band-pass filter recent meteorological data with a period range of, for example, 3 to 10 days, so that only cyclones remain as fluctuations in the data fields. A 4th order electrical bandpass filter can be simulated by a vented box in which the contribution from the rear face of the driver cone is trapped in a sealed box, and the radiation from the front surface of the cone is into a ported chamber. This modifies the resonance of the driver. In its simplest form a compound enclosure has two chambers. The dividing wall between the chambers holds the driver; typically only one chamber is ported. If the enclosure on each side of the woofer has a port in it then the enclosure yields a 6th order band-pass response. These are considerably harder to design and tend to be very sensitive to driver characteristics. As in other reflex enclosures, the ports may generally be replaced by passive radiators if desired. An eighth order bandpass box is another variation which also has a narrow frequency range. They are often used to achieve sound pressure levels in which case a bass tone of a specific frequency would be used versus anything musical. They are complicated to build and must be done quite precisely in order to perform nearly as intended. In neuroscience, visual cortical simple cells were first shown by David Hubel and Torsten Wiesel to have response properties that resemble Gabor filters, which are band-pass. In astronomy, band-pass filters are used to allow only a single portion of the light spectrum into an instrument. Band-pass filters can help with finding where stars lie on the main sequence, identifying redshifts, and many other applications. ^ E. R. Kanasewich (1981). Time Sequence Analysis in Geophysics. University of Alberta. p. 260. ISBN 0-88864-074-9. ^ Norman Stuart Sutherland (1979). Tutorial Essays in Psychology. Lawrence Erlbaum Associates. p. 68. ISBN 0-470-26652-X.